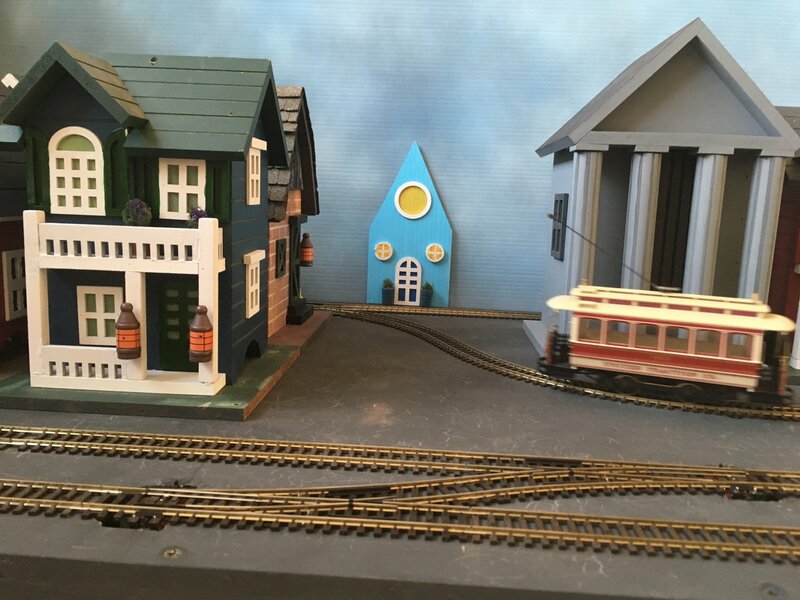 With a OO outdoor railway and a OO indoor tramway, I've become rather tempted to build a outdoor tramway, but with a twist. I'll stick with the same track, 16.5mm (OO/HO) but run narrow gauge O on it. In the UK that's O-16.5 where as in the US it's On30. The idea appeals because it allows me to work in a different scale, (UK 1:43.5, US 1:48) yet without the big hike in cost. Bachman USA do a fair amount of On30, including some Street Cars based on no particular prototype. Having built my outdoor railway on a shelf a metre above ground I think that the garden tramway will be at ground level. So far I've resisted the temptation to buy a On30 tram, but I know I'll crack soon. I'll have to spend some time on here going back though all your threads of building at ground level to work our how I want to build the track bed. There is so much wonderful stuff for this scale. If you get a hankering for Colorado narrow guage you'll be amazed at the products you can find all ready painted. If you do go Colorado I would suggest this book as a great source of trackage info. It seems the Bachman Shay is out of production, but it is a truly wonderful loco. I can't tell you how tempted I've been to dabble in On30 baased solely on thhis loco and the fact that I live very close to where the Gilpin tramline was located. I'm still at the stock acquisition stage on my narrow gauge railway. Can't get my head round where I will build the garden railway. I've got a couple of locos and a few coaches. In the middle of bashing some OO wagons into 7mm narrow gauge ones. Wakefield show is at the weekend. I'm planning on popping over to make some purchases of donor vehicles. I've been repainting stock, building wagons, constructing buildings and falling on my On30 feet this winter. This loco and coaches came in a "novelty" livery. That has been removed and repainted black and olive green, DCC has also gone in. Moving up scale to 1:48 (staying at 16.5mm gauge) I decided to look into wargaming models. There is some really good stuff at what they call 28mm, which is the hight of the figures. Later cut MDF at reasonable prices that make very impressive models. A quick couple of coats with aerosol primer and a little black paint on the windows and this station is straight out of a western movie! In the foreground is a lumber wagon, that started life in 1980 as a Hornby Freightliner flat. So far I've only bought one wagon, the tanker, mainly to give me a model to copy. The 4 wheel wagon is a 30 year old Hornby wagon with the body removed and replaced with a larger scratch built open frame. Kadee couplers were also added. The 8 wheel gondoliers started life as an American HO box car. Again the body was removed and a new one created from Correx, Plasticard strips and coffee stirrers. Being american it came with Kadee couplers so there was very little cost over the £5 I paid for the secondhand wagon. Last week, doing my weekly shop in Lidl I came across some novelty bird feeders. 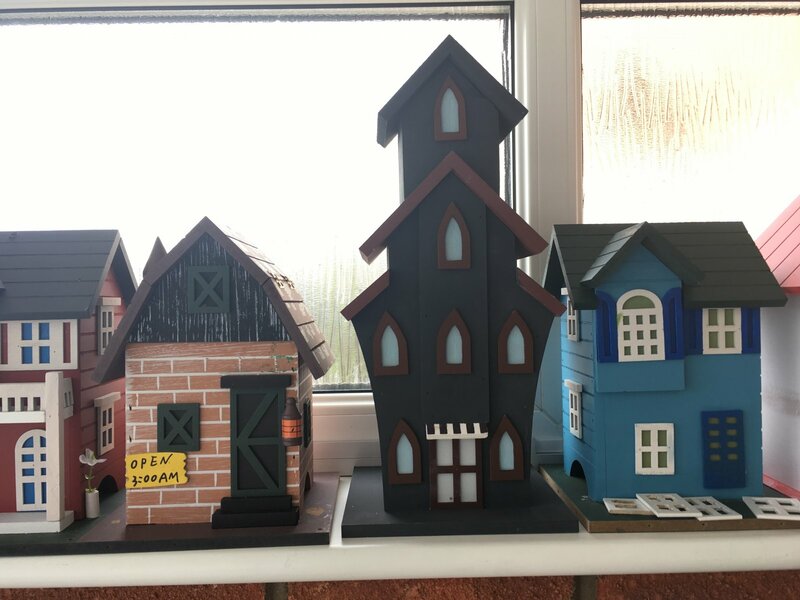 They were in the shape of houses, which looked impressively close to 1:50. Finescale they were not, but they did have an American model village vibe about them. I bought 3 at £7.99 each. When I got them home I removed a few features that weren't required, mainly the hook you would hang it from, and they really looked the part. I went back to lidl and bought another 5, so I have 2 of each design. I want my On30 railway to be a lot less serious than my other modelling projects and these literally cheep and cheerful "models" are certainly less serious. I've made a start on "improving" them by repainting one into light blue, but appearing from adding a chimney or two I won't be doing much to them. They may inspire further constructions in this style. Nice work Chris. I really love it when shops come up with cheap, usable alternatives to established sources. I think the buildings will look great, with a bit of fettling. Switched my weekly shop to Aldi this morning. They had bird boxes of a similar design, albeit not quite as good design, but for only a fiver. I bought 3. Plenty of fettling to be done. 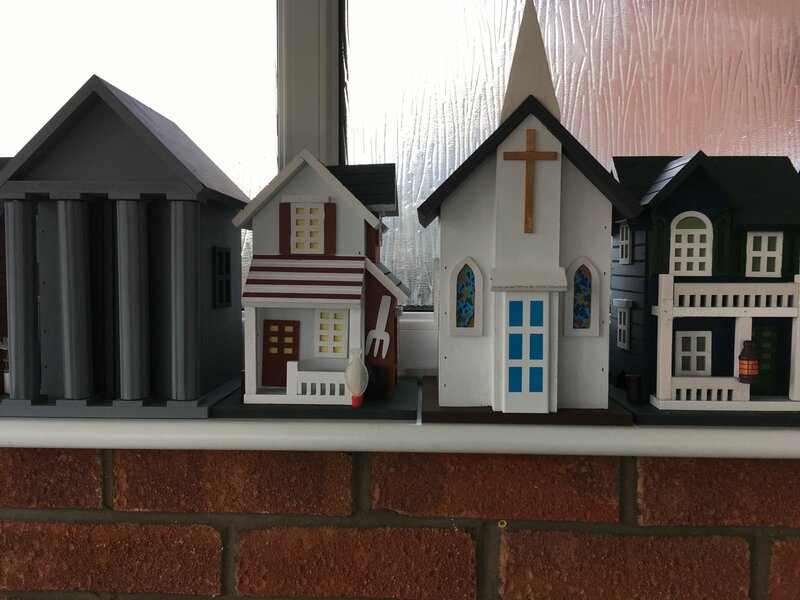 An Aldi bird box has been given a Gothic make over. I visited a different branch of Lidl at the weekend. They still had some of the bird feeders, but at the reduced price of £6.99. I purchased another 3. Lots of progress on this in the last few days. 2 4ft by 2ft baseboard have been constructed. Nearly all the track has been laid. The buildings are basically ready. The back scene is getting close. I'm planning on Taking it to my Coffee Shop to show it on Saturday, so I need to get a move on. The big job is the electrics, point motors and DCC Accy decoders. Track complete. Electrics sorted. DCC Street Car running. Todays job is the back scene. Way to go! That is the one thing about the On30, you can use all kinds of nearly scale models from houses like you've got to metal cars. I like the panels you've made. It all seems very portable. I got the temporary backscene sorted and took it all down to our coffee shop on Saturday. It went down a storm. Lots of work still to be done raising the baseboard level up to the track. I've got a good supply of hard board ready for that purpose. I cycled up to Grosmont today and found that the secondhand model shop that used to be in Pickering is now at the other end of the North Yorkshire Moors Railway. I purchased a handful of 1:43 scale cars that will fit this scene nicely. I do have a slight problem with this Snickleway. My wife likes it so much, she wants it in the house rather than the garden. 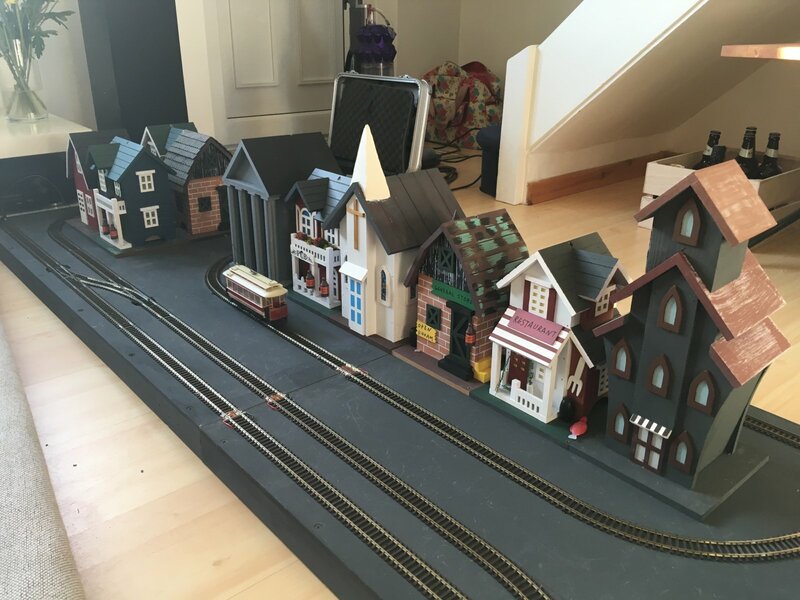 The whole reason I started with garden railways was because our house is too small, I've no idea where we are going to put it. Not the worst problem to have. This layout has taken up most of my modelling time this year. Yet visually very little has changed since these photos were taken. What is interesting is that the fact that none of the building are attached to the baseboard. 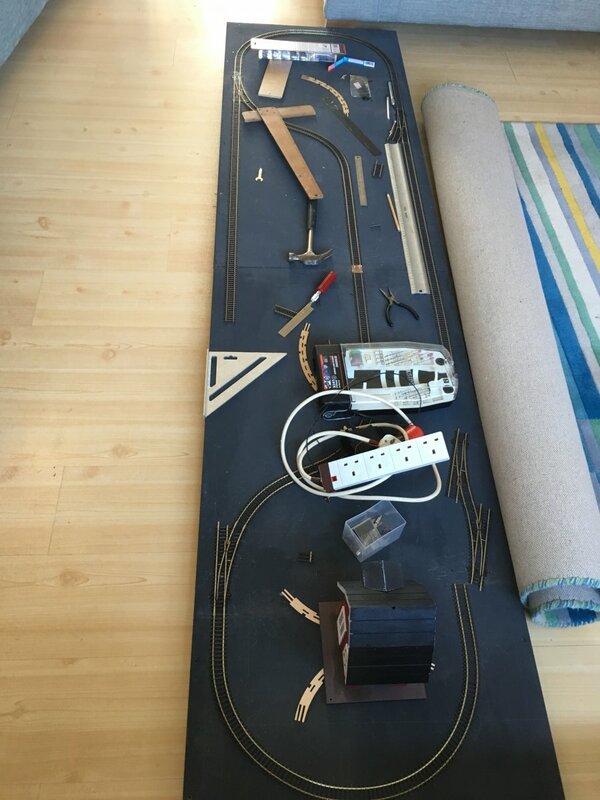 I have come to realise that the track layout would be suitable for other layouts on OO or HO. I'm tempted to do a UK industrial scene and possibly a North American HO tramway. However, the curves are 8 inch radius, so my rolling stock choices are limited. On30 is very flexible on the curves. But do have to be choosy about what to run. No K-36 locos for 8" curves. And you can also be a bit flexible on the scale. I've been modifying old Tyco trains for 1/55th scale, which is very close to 1/48. I think those can do a very sharp turn, just have not tested them. I am actually planning on using 15" radius curves. Big push to get this ready for the weekend. 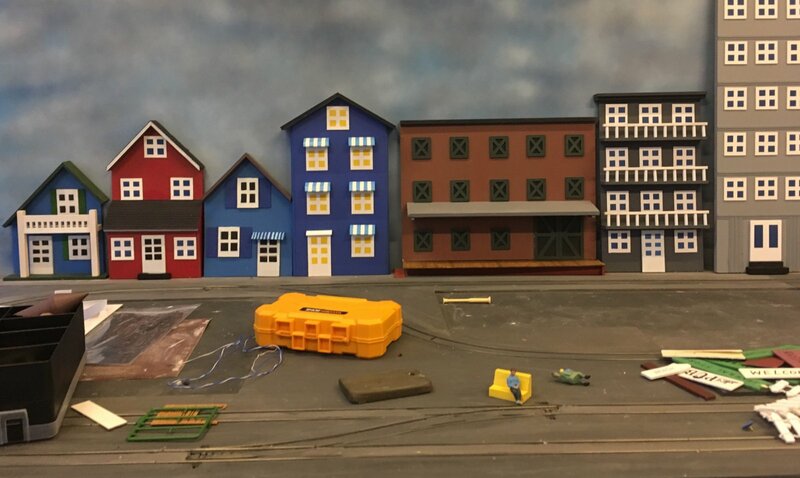 I've been working on the back scene buildings all day. Pretty much done now, apart from the one on the right. Next stage is to fix them all into position. When it comes to the scenery my scale is way beyond approximate, I'm just making it up. It looks good to me. It's why I am liking my dalliance into Narrow gauge. I can be really sloppy and no one will know. There is a good deal of freedom to being able to "just make it up" as you go. That last building is an art museum from the Bahaus school of minimalism. That last building was going to be a hotel, but has just switched purpose to a cinema and is awaiting a refit! Truth is that the last build is a actually removable so I can use the electrical socket that is on the wall behind it. That's why its so much larger than the others. All the buildings the back scene are made of scrap and junk I had lying around. The backboard is some old hardboard a friend gave me. discounting the rolling stock, I've not spent more than £10 on any single item on this layout. Hi Chris, happy new year 2019, those building look real good did you scratch build them all, I haven't started work on my station building will in next couple of days. 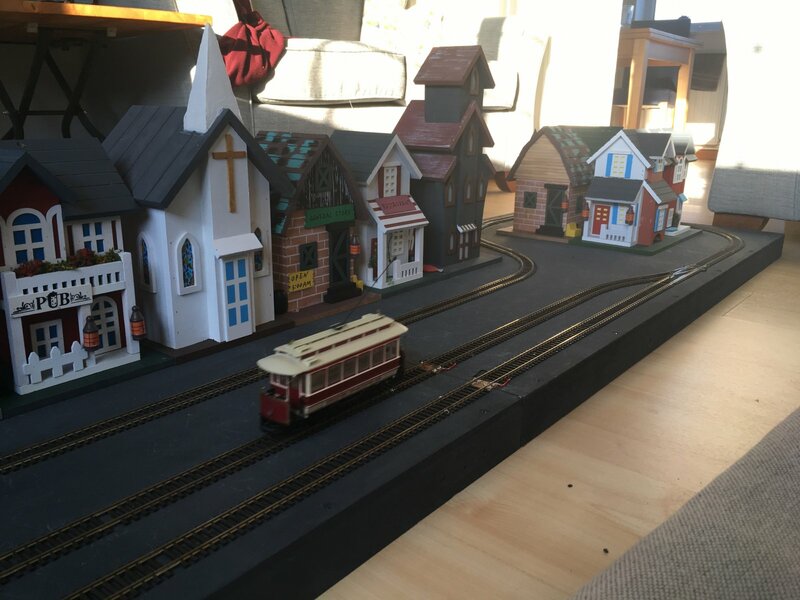 Will be on the search of a city back scene to bend in with the station building, it has being too hot here and came out of hospital Friday, take a while to get back on my feet before I start any heavy work on Camdale, wait to the cooler months in March. The free standing buildings are all novelty bird boxes and bird feeders. The back scene buildings are all scratch built from scrap plastic I had accumulated. 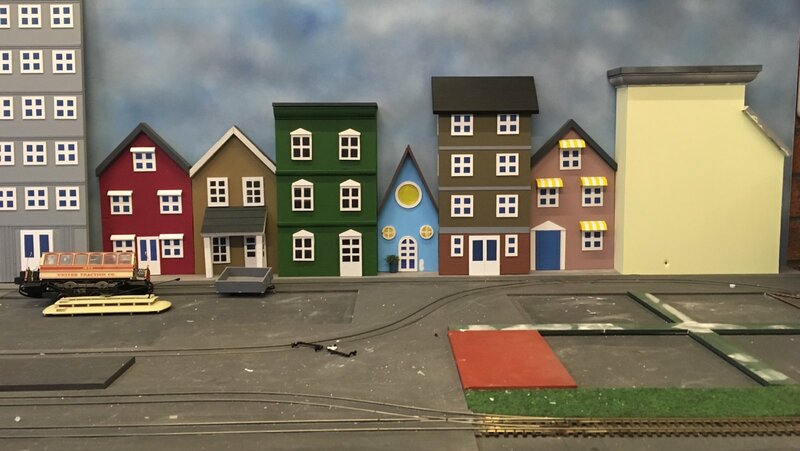 Remember that this is O narrow gauge, so still 16.5mm track but buildings are closer to 1:40 and deliberately cartoon like.